The Woodbridge Estates home subdivision are part of the Woodbridge Village in the City of Irvine. It consists of 317 one and two level paired and attached on one side homes built by Irvine Pacific home builders in the late 1970's. The Estates home tracts are primarily located on south of Irvine Center Drive, north of Barranca Parkway and west of Yale Avenue. Homes offer five floor plans featuring 2, 3 and 4 bedrooms ranging from 1,520 to 2,040 Square Feet. The Woodbridge Estates community offers five floor plans which are as following. Plan A (Jefferson) features 2 Bedrooms, 2 Baths, 1,520 Square Feet, one level of living space with a two car garage. Plan B (Lincoln) features 3 Bedrooms, 2.25 Baths, 1,875 square feet of living space and a two car garage. Plan C (Adams) features 4 Bedrooms, 2.5 Baths, 2,161 square feet of living space and a two car garage. Plan D (Washington) features 4 bedrooms, 3 Baths, 2,300 square feet of living space and a two car garage. Plan E (Madison) features 3 Bedrooms, 2.5 Baths, 2,044 Square Feet of living space and a two car garage. 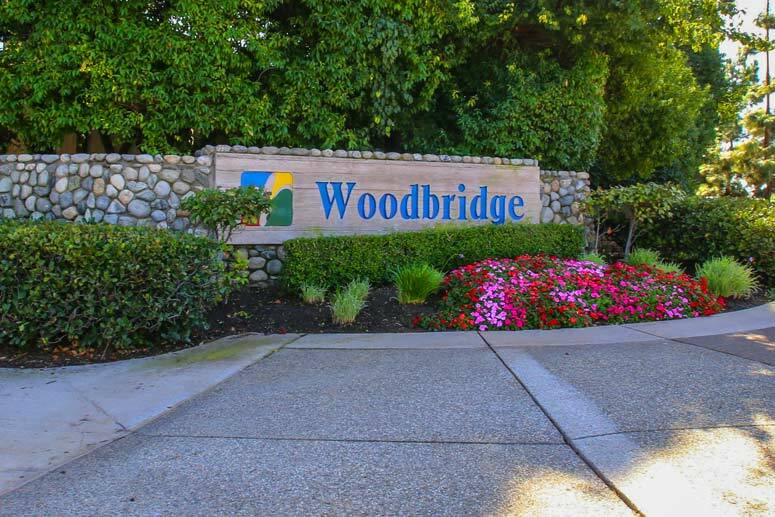 The Woodbridge community offer an abundant of amenities which include tennis courts, green parks, association pools and spas. Residents can enjoy the use of both north and south Lagoons and club houses. The Woodbridge Village Master Association is managed by Woodbridge Village Master Association located on 31 Creek Road Irvine California. Their contact number is 949-786-1800. The master HOA due is approximately $355.00 per month. The sub-association is Estates Maintenance Association and is managed by Western Property Management located at 23046 Avenida Del La Carlota Suite 700 Laguna Hills California 92653. Their contact information is 949-334-6025. Sub-association dues are approximately $82.00 per month. Schools are the award wining Irvine Unified School District. Schools are Stonecreek Elementary School, Lakeside Middle School and Woodbridge High School. Please, have a look around, and contact us with any questions you might have about buying and leasing in Woodbridge Village. No question is too mundane - we want to help!